This greeting was sent to us by an Eye-wear company we had used over the year. I took out their logo and just retained the things they were wishing for their customers this new year. Can you see which word caught my eye ? I forgot: they are French words so I should translate them for you. spiritualité = either our spirituality ie. to do with the spiritual aspect of our lives, or liveliness and wittiness of mind. Apart from the word 'luck', we can turn each of these words into a blessing for each other. Shall we try ? May the Holy Spirit be the source of your vitality and spiritual well-being; may His inspiration be the foundation of your daring and passion as you minister in His mighty name ; may you know that your happiness and success are God-given blessings. This has nothing to do with luck ! And all to do with the sovereignty of our Eternel God. Our very best wishes to you for 2015. Christmas preparations are not nearly so frenetic as in English-speaking countries, but there are plenty of things to do. I especially want it to be a special time for my family to create traditions, to reveal the real meaning and joy of Christmas. Our churches organise Christmas plays and our country church has quite a reputation for its plays and atmosphere. We usually do 2 sessions and can get up to 250 people attending. Unfortuately, the Christmas play is an end in itself, and in the 7 years we have been in this church, I've never heard our parishioners speak of it as an occasion to do serious outreach and follow up. We've never had new people come to the church as a result of what they experienced in the Christmas play. But Christmas is an ambivalent time for me and I have reasonably regularly become ill over this time - usually after the Christmas plays. I think it's a psychological reaction to Christmas not really being what I would like it to be, notably spent with my Australian family. Thank God, they have been able to come over every few years to share with us and especially to have the joy of seeing their grandchildren. I have rarely been to Oz for Christmas because it's just not possible to get away. So I feel alone and not very motivated even to organise things to have more people around. When you are in leadership, people expect you to be the motor, and don't consider that you might like NOT to have something to prepare yet again. People around here don't invite easily outside of their own family. There isn't that same ability for everyone to muck in and have a good time together. I'm in bed with the flu again, trying to convince my psyche that it is possible to stop the self-pity and the discouraged attitude. Why do I want Christmas to be special ? What is the most important thing ? What is it I really want, but can't have ? Allez, a little rest, catch up with my daily Bible readings, read a good novel, make the most of the occasion to do Christmas mail before the 25th December! Ask the God of the Spirit of Christmas to show me why this Christmas is important for Him so I can also be caught up in the wonder of this amazing story. PS. This year we have been invited to stay with good friends near the Alps for the New Year. So it will give us a chance to get away from leadership and just enjoy being with friends. Their children have flown the nest and we are one short, him being in Australia this year for his studies. Thanks to IMB for these realistic portraits. Bretagne and Normandy are real spiritual deserts. I am part of the Women's Christian movement: Femmes 2000 and our sisters from these departments (and they are few) often express loneliness and fatigue linked to the struggle to bring the Gospel to these areas. The National Council of French Evangelicals has launched a church-planting campaign over the next 10 years: aim: 1 Evangelical church for 10,000 people. "Like every morning, Nicolas walks into his small protestant chapel on the rocky Bretagne coastline today at 8am. He opens the door, sits down at his desk with a warm cup of tea and opens his Bible. He hopes that today someone may visit, ready to hear about the grace of God found in Christ. But he is also downtrodden by hundreds of days of experience that tells him no one will come. He longs to see his fellow Bretons come to know Christ, but they are spread vast and wide in tiny villages, and their culture has taught them that the church is an institution not to be trusted. Pray for Nicolas and his church to become a light for their community. Pray for the villagers of the west region to come in contact with Christ. In the West there are less than 3 churches for every 100,000 people. Most villages have less than 5000 people. Pray for new communities of faith to begin all over the region." "Elodie sits in her room and scans through her twitter feed, half-noticing the music videos playing on her television. She is appalled at the constant polarization of politics in her country. From election to election it seems France swings from right to left and back. Always extremes. Always debates. Always outcries that the country is crumbling. She knows the issues: immigration, taxes, retirement, gay marriage, wages… She knows her parents consistently hold conservative viewpoints, but has never understood why. She wonders if it may have something to do with the Catholicism to which her grandparents ascribed. When Elodie’s phone buzzes she gives a quick response to her friends, promising to come join the evening hike as soon as her typical Sunday family luncheon ends. Pray for the new generations of France, who are growing up without the religion of their grandparents and without the political conviction of their parents. Pray for central France, a loosely populated area known for agriculture and a slower pace of life. There are few churches within impacting distance of most people in the center. The people in central France are slow to change and weary of outsiders, but this region has influence throughout France." "On the train to his hometown for vacation, Enzo eagerly awaits seeing his family and friends. Through the window, he marvels at the landscape of southwestern France. Medieval castles dot the hillsides and rivers snake their way into hidden valleys. These views remind him of the long heritage he has in this area and of the regional pride he feels every time he gets to tell people where he is from. Even though, like many people, he moved away for school and work, he returns as often as possible. Here he finds his true friends, the ones he has had since he was in preschool and grade school. These are the people in which he really confides and leans on for support. Such friendship is not easily reproducible later in life. Please pray for the many people in France who are looking for community but do not even know it. Pray that they will find community with the few believers they might run into. Pray that the kingdom of God becomes a tangible and welcoming community throughout the Southwest and France"
My husband and I are discovering just how hard it is for our Christian community to develop a sense of community and to be open to new people with different ideas and culture. Please pray for us as we lead them on to what we call the Vitality Pathway. Vincent is a semi-retired owner of a gîte, a French guesthouse, and has lived his whole life in the mountains and valleys of eastern France. To him everything has stayed the same and yet completely changed. The sheep of his great-uncle are still around but are now penned up and on display for tourists. His grandparents’ little Protestant church with the creaky wooden pews continues to stand strong, but now welcomes cameras instead of prayers. The old ways are passing away. Vincent wonders about the new ways to come. Though Vincent loves that many guests come through his home, every summer he looks forward to one group in particular. They are from a Protestant church in eastern France. In spite of the rich heritage in the region, most people see churches more like museums than places of worship. But, this group—they sing songs as though they mean something. They talk about what they believe. It seems to Vincent that they have a real community. Pray for new, relevant expressions of church in Vincent’s region of France. Pray for churches with vibrant worship and authentic community that reach out to and support families and singles alike. Pray believers would be bold in sharing and living out their faith"
Our Ardèche area is filled with gîtes, guest houses, and the owners love to share their local culture with their visitors. For many, the income they receive from the rent is vital over the summer months in order to survive the year, pay their social taxes and this income allows them to continue to live the life-style they prefer. Funnily enough, our small country church of 35 worshippers at a service is blessed by the summer visitors who choose to continue to come to church even when on holidays. So we don't get emptier, but fuller. Pray for our capacity to welcome all visitors, but also to open up to the world in order to be attractive to our local people who don't know Christ. Thank you for such good portraits. These ressemble people I have met over the years. Although it is the stuff of operas and novels, surviving as an artist in Paris is not an easy life. Jean-Marc has experienced this reality for years with the depression and loneliness that it brings. While living from one artistic endeavor to the next, he is constantly seeking that one big break that will launch him into the real fame and money that the art world can offer. When he is not alone at work in his cramped studio, he can be found down the street in a dark bar. He is there drinking and talking with his artist friends into the early morning hours, all of them with their own depressing stories to share. If you had a chance to talk with Jean-Marc about faith, he would interrupt you quickly to let you know he is an atheist, hoping to put an end to the conversation. It’s not that he has thought through the matter. It is just what he has been told throughout his schooling. Pray for the artists of Paris like Jean-Marc. Pray that the Creator would reveal himself to these creative people which He loves so dearly. Pray that a church community would arise for artists of all kinds where they can share hope, joy and encouragement as well as express their faith to the city through their creative gifts." There are several Christian artistic associations working among and encouraging artists. France is a great country for respecting artists, even if it remains difficult to make a living from it. In our Ardèche area, there are many artists; crafty people!! It's cheaper to live here, and the natural beauty and calm can be conducive to creativity. Artists also have a heightened spirituality: but don't often hear about Christ in a way that meets them where they are at. Pray for Christians to work outside of their traditional moulds. I borrowed their mini-portraits in their prayer effort for France. Very well written. "Lisa and her family moved to the city of Marseille for work opportunities for her and her husband, Frank. They work, shop, and take their kids to school all in the same neighborhood, trusting the comforts of local experience. Marseille is now home, but rarely a day passes where she does not hear about the violence, drugs, and underworld that permeate her city, especially at the youth level. She worries that her family cannot stay long in this city. Some studies say that nearly 34% of students in Marseille will use drugs and a third of those will deal in drugs. Far too many deaths in Marseille are premature and violent. Throughout the southern region, unemployment sits around 18%, meaning opportunities are hard to find and many families feel stuck in their situations, desperate for help. There is not a church in Lisa’s neighborhood, and the thought of God as a protector, refuge, or guide has never really crossed her mind. Pray families like Lisa’s in Southern France would hear about the hope found in Christ. 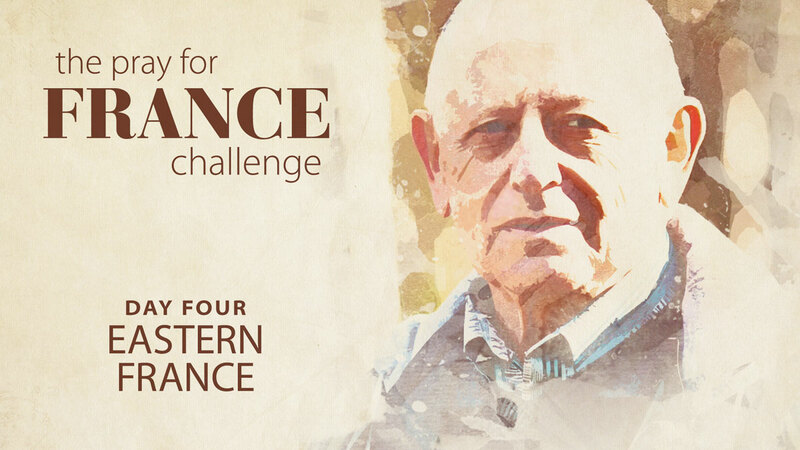 Pray that lives in Southern France would be transformed through repentance and a life devoted to God." What's the definition of persecution? A typical Sunday congregation: there's not that many of us! Here we are sending words of encouragement to persecuted Christians through the Open Doors organisation. We have it so easy in some ways in this secular French society: freedom of worship is guaranteed. Open Doors informs us that there have never been so many Christians persecuted for their faith in all of history. So with this freedom we have, why aren't more people coming to Christ in France? Because, we are not fulfilling our part of the Great Commission. We must start the Vitality Pathway - and learn what it means to stand out as Christians in a very secular community. However, you should know that we do suffer a very subtle form of persecution in France. This so-called tolerant society is not so tolerant when it comes to faith questions. Example: The Gideons came and distributed New Testaments in front of the local High School (where my daughter goes). There was an outcry especially from the teachers who claimed to want to protect minors from aggressive proselytisme! During a parent information evening which I attended, the Principal explained he had been contacted by the Gideons about their future action and had indicated his opposition to the idea. However, legally they are allowed to do it on public walkways, so he couldn't ask the police to intervene. He called the Bible 'evangelical literature'!! Spot the error! After the meeting, we were invited to drink something. I was talking about the incident with another parent. I suddenly noticed 2 posters next to the row of lockers where we were standing. One poster had a large question mark filled with different types of sexual tendencies: an ad for a telephone counselling service for High School students who want to talk about their sexuality. The other was a photo of 2 soccer players head to head but in a friendly way and it was an ad against insulting homosexuals with a website www. alert homophobie.com. In France, anyone expressing the idea that homosexual practice is not normal or desirable from God's point of view is called a homophobe. And these posters were on the school premises. And the Bible is not allowed a look in! Other examples are in the legislation surrounding religious congregations and associations. We are penned in by rules and regulations for pastoral salaries, our premises, how we count the number of members, limited in the money we can raise and how much, health and safety issues. I heard just recently that the Government is going to bring in laws about the appropriate training certificates needed for the people who teach Sunday School! (or anyone who is going to work with children in any area). Read more about What's the definition of persecution? Sorry it's been so long between posts: been busy! With what ?? Well, one Sunday, I made bread during the church service. We wanted to have the lovely smell of baking bread wafting through the church as people arrived, but I couldn't use the church kitchen oven. So we made toast with our toaster in different parts of the building! The yeast has to touch every part of the flour in order to produce the rising effect. And the yeast has to be activated by the warm water. We wanted the congregation to realize that they are the yeast and they have to be out in their world making a difference. Maybe we could go as far as to say that the water which activates the yeast is the Holy Spirit! The flour is obviously the world at large. And our action and our presence will make a difference to the world we are in. This parable is Jesus' promise that the kingdom of heaven is growing inexorably and will reach every single portion of this Earth. But we have to play our part as yeast. Our numbers are going down. We are not bringing new people into the church. We are not doing our job for Jesus. Please keep praying that the Vitality pathway we have started introducing to the churches of our Union will revitalize our congregations so they will have a definite impact on their communities.